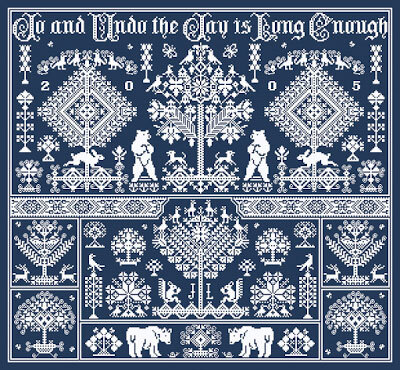 Throughout the 17th century Dutch samplers, particularly those from the provinces of Groningen, Friesland and North Holland often featured their own very distinctive form of the Tree of Life. The trunk was symbolic of force (the father) and the foliage of abundance (the mother) whilst the whole tree, with it’s cyclic nature, stood for renewal and immortality. Opposing pairs of birds were almost always perched round the branches as a reminder of the life eternal. And, – yes, they do!